Learn to evaluate the muscular compensation in any dog, regardless of breed, age or discipline. When the dog feels discomfort, or pain, automatically he adjusts his gait and develops muscular compensation in order to avoid that problem and to maintain optimal performance. This course teaches you to recognize the various signs of muscular compensation at rest and at any other gait. This unique knowledge, combined with your massage skills, will assist you in maintaining your dog wellness and fitness level at its best. The basics of the canine myofascial system. The basics of canine kinesiology, the study of movement. The basic gaits of the dog. The external lines of compensation with the diagonal, transverse and sidelines of compensation. 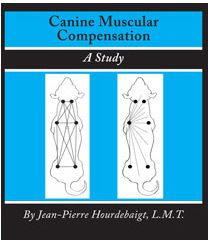 The internal line of compensation and their influence on the dog’s center of gravity. Detailed information on each individual muscles and its role when in compensatory mode. Precious information on common problems and their compensation pattern. This course will improve your understanding of the dog’s overall balance at any gait and will develop your skills and confidence in evaluating the canine muscular compensation phenomenon. It will contribute to your overall dogmanship expertise. This in turn will definitely improve the quality of your massage application and its lasting benefits. This course provides the information you need to upgrade your skills and stay competitive in your field. Click the button below to register for this Continual Education Course.